Many of the organic latex mattresses we sell at The Natural Sleep Store are made with layers of natural latex/natural rubber and are encased in a zip-off organic cotton and wool encasement. Alternatively, we sell non-layered mattresses that are made with a solid piece of natural latex/natural rubber, innerspring coils, or a combination of both. The non-layered mattresses are also encased in organic cotton and wool but instead of having a zipper, they are enclosed (sewn together) like a traditional mattress. Choosing a layered mattress over a non-layered mattress has a lot of benefits! We love that you can adjust the firmness level of a layered mattress, that it is easier to move than a non-layered mattress, and that it lets you see exactly what is inside of your new organic mattress. Often people purchase a new organic latex mattress and are extremely happy with the firmness they chose, but in some instances people choose a firmness that might be just a bit too soft or too firm. When you buy a mattress that comes in components it allows you to purchase a new layer to swap out with one of your original layers. In exchanging a layer of latex for a firmer or softer layer, our customers are able to find a firmness level that is just right. Another scenario that could be unforeseen at the time of purchase is the possibility that your body and needs could change over time and affect what you need from your mattress. With the flexibility of purchasing new layers for your mattress you then have the ability to keep your organic mattress while adjusting it to meet your new needs. When trying to move a new mattress into your bedroom there are various obstacles that might pose a problem, especially when maneuvering queen or king sized mattresses. Older homes often have smaller rooms, hallways, stairwells, and doorways. Some apartments have many stories but have no elevator to access the top apartments. Some homes even have fancy winding staircases that can pose significant trouble in getting a mattress upstairs. A layered mattress might be the perfect solution! A layered mattress can be disassembled and fit into wardrobe sized boxes or smaller—this can make moving much easier. I can speak from experience. I just moved my king size Bella Sera Nove 3 mattress to a new apartment. Moving my Bella Sera mattress that breaks down into three separate boxes was far easier than moving our guest bedroom queen mattress that is constructed in one piece. 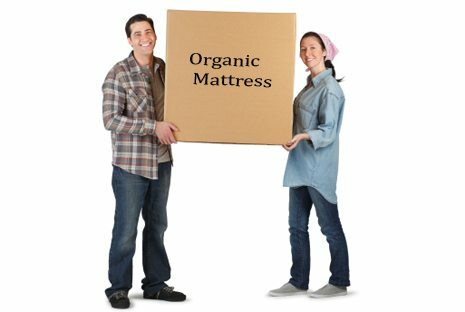 When you purchase a new organic layered mattress you will assemble the mattress upon delivery (or contact us if you would need a “white glove” delivery where the mattress is set up for you). Since you assemble the mattress yourself, you will see exactly what it is made of. When you purchase an enclosed mattress, you only see the outer fabric. If you purchase a layered mattress, you will see each of the pieces of natural latex and, although the wool is quilted in between two pieces of cotton, you see the outside organic cotton fabric, the inside organic cotton fabric, and you can squeeze the fabric between your fingers to feel the wool quilted in between. We like offering peace of mind that what you are buying is pure and natural, with nothing hidden. The Natural Sleep Store sells layered mattresses by Bella Sera Organics, Savvy Rest, Sueno, Green Sleep, and Suite Sleep. With any of these fantastic options, you will sleep better and not breathe any toxic chemicals as you would with a bulky, rigid conventional mattress. Additionally, you can change your firmness level over time to fit your needs, you will find it easier to move, and you can see exactly what your mattress is made of. We love our layered mattresses!